Not seen before. The flight suit is unorthodox. The aircraft is a little unorthodox too. 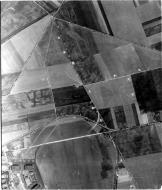 As Doug quickly surmised the aircraft and pilot are from the 7th Photo Reconnaissance Group based at Mount Farm, Oxfordshire, UK. The flight suit was one of three obtained by pilots of the group at Wright Patterson and was reportedly an experimental design for high altitudes. It was not a g suit but was quite warm and was one piece thus being less bulky than the two piece standard issue American suit. 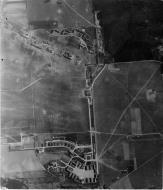 Wiebe was with the 13th Squadron of the 7th Photo Group based at Mount Farm, UK. My father went to grade school with him in Dallas Oregon. He was KIA on August 23, 1944 near Freiburg Germany flying F-5E 43-29030. He was reportedly intercepted by enemy aircraft. This was a day after he received his promotion to 1st Lieutenant. 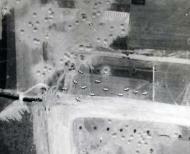 The pilots of the 7th Photo Group had no weapons and relied on their flying skill to evade intercepting enemy aircraft. Quite often they were not successful. 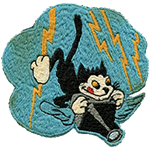 "Blick" as he was known for obvious reasons was a pilot with the 22nd Squadron of the 7th Photo Group based at Mount Farm, Oxfordshire, UK. He was KIA (KLOD?) 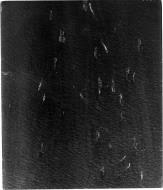 on January 19, 1944 near West Wycombe, UK due to bad weather. The A/C was F-5 42-51360. He was a good friend of my father who was also a 22nd Squadron pilot at that time. That is Lt Arthur K Leatherwood on the left and my father Lt John S Blyth on the right. They were with the 14th Squadron of the 7th Photo Group based at Mt Farm, Oxfordshire, UK. The photo is from 1944 and I don't know the serial number of the A/C. Doug? Maybe it is Lil Punkin II or something like that. Leatherwood passed away on August 29, 2009. Lt Charles JJ Goffin was supposedly the only Belgian to serve with the USAAF in any capacity during WW II. I think that he lied about his age because he was born in 1913 rather than 1919 as is commonly reported. Before we entered the war Goffin shot down two 109s flying an Italian biplane. He was blind in one eye and I have no idea how he passed the physical. On September 8, 1944 he was sent on a mission to map the Siegfried Line. It was later confirmed that he was KIA near Mersch, Belgium which was very close to his hometown. He was flying Spitfire MK XI MB 952. Charlie was a good friend of my father and Belgium can be really proud of him. Chapman and the famed RAF pilot Adrian Warburton took off together from Mount Farm on a mission on April 12, 1944. "Warbie" did not return and his remains were not discovered until 2002. Here is a link to part 1 of a five part segment about Warburton and his final mission. Chapman is part of the story. Miller was from Tacoma and was KIA June 29, 1944. Location and cause were listed as unknown. Sortie 2150 of the 7th PRG. He was flying F-5C 42-67111. Unidentified left and right. Richards served with the 13th and 14th Squadrons of the 7th Photo Group based at Mount Farm, Oxfordshire, UK. He flew 51 missions in F-5s, Spitfires and the P-38 ELINT Droop Snoot and was one of two members of the 7th PRG to receive a DSC. There was flak damage to the wing, prop and horizontal stabilizer. 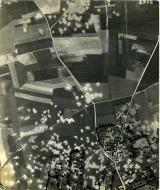 He had just returned from Meresburg/Leuna bomb damage assesment. Most missions were flown unarmed and alone. Due to interceptions by ME 262s late in the war the 7th Group began assigning escorts on certain deep cover missions. Egan and Lt Bruce B Fish were accompanied by 8 P-51s from the 55th FG. This was December, 1944. Pilot is Lt Robert "Tubby" Carlgren with Major Walt Weitner on the right. He was downed by jets on December 23 or 26, 1944 near Magdeburg and became a POW. On September 13, 1944 he was being escorted by four P-51s when they were intercepted by two ME-262s. Carlgren managed to evade and completed his mission. One P-51 was damaged but they all returned to base. Serial # of this A/C is 43-28972. "Blick" was KIA January 19, 1944 near West Wycombe, UK. He was flying F-5 42-51360. He bailed out too low. Is that his crew chief on the left? Lt Kraft served with the 14th Squadron, 7th Photo Group, Mount Farm, UK. He was KIA while flying a courier mission in the 8th AF's only B-25 "Miss Nashville". He was downed by flak on October 26, 1944 near Mourmelon Le Grande, France. He had just dropped off Lorelle Hearst in Paris. She was the wife of William Randolph Hearst and was sent to Paris as a correspondent. B-25 42-53357. "Doc" survived a harrowing bailout after the tail broke off his F-5 (P-38) at 35,000ft. His mask was ripped off and he was hit by hailstones. Pulling the ripcord at about 5,000ft he found himself hanging by his leg with his head downward. He managed to right himself and was rescued by two English girls. The full account can be found in "Eyes of the Eighth" by Patricia Fussell Keen. "Doc" served with the 7th Photo Group based at Mount Farm, UK. This "war weary" Spitfire MK Vb came from the Eagle Squadron and was assigned to the 7th Photo Group based at Mount Farm, Oxfordshire, UK. It was used for training and personal use was also allowed. Notice the clipped wings for quicker roll rate. There is a 14th Squadron Spit MK XI visible in the distance. Berlin-Mariendorf: Berlin August 6, 1944. 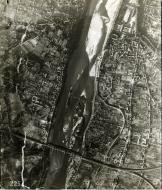 Per SgML12 the photo shows Berlin-Mariendorf with the Trabrennbahn horse racing track in the upper left half. 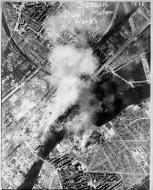 Berlin 4: Diesel Motor Works Berlin August 6, 1944. 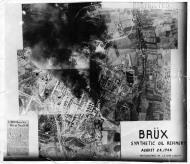 Brux Czech Republic: Brux (now Most) Czech Republic August 24, 1944. This was for bomb damage assessment of synthetic oil refinery. 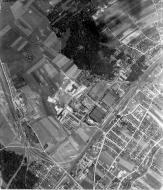 Dessau Airfield Germany May 30, 1944: Luftwaffe factory airfield May 30, 1944. 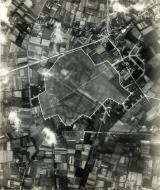 This was a Junkers factory airfield. 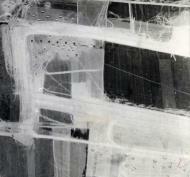 It is possible that there is a captured B-24 at the far left of the airfield lower center. A B-24 undercarriage was reportedly used in a prototype of the JU 287 jet bomber. Numerous other aircraft are visible including a possible JU-290. JV has suggested the other aircraft may be JU 252s or 352s, an HE 111, JU-88s or 188s and a possible HE 177. Photo by Lt John S Blyth of the 14th Squadron 7th Photo Group Mount Farm UK. He was flying Spitfire Mark XI PA841. Best viewed in original size. Photo taken from about 30,000ft. Halberstadt Airfield Germany July 7, 1944: Luftwaffe airfield Halberstadt Germany. Lots of aircraft on the ground July 7, 1944 including a Heinkel 111Z or Zwilling glider tug. There were a total of 12 built. Best viewed in original size. Photo by Lt. John S. Blyth flying a Spitfire MK XI. Photo was taken from about 30,000ft. Halberstadt Airfield Germany Crop: Rare Heinkel 111Z glider tug at Halberstadt Airfield. Possibly some fighters as there was a big air battle that day July 7, 1944. Several of them landed here to rearm and refuel. Koethen Airfield Germany 1: Luftwaffe Airfield Kothen Germany August 24, 1944 with many aircraft visible in pens. There are also a number of flak batteries if I am not mistaken. This was sortie 3065 of the 7th Photo Group. 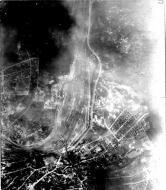 Photo was taken from about 30,000ft by my father Lt John S Blyth. He was flying Spitfire MK XI PA944. Koethen Airfield Germany 2: Luftwaffe airfield Kothen Germany August 24, 1944. There are a number of aircraft visible in the lower left near the hangars. Photo was taken from about 30,000ft. Koethen Airfield Germany 3: Luftwaffe airfield Kothen Germany August 24, 1944. 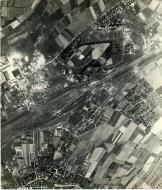 Laon Athies Airfield Occupied France: Luftwaffe airfield occupied France April 23, 1944. This was supposed to be for bomb damage assessment purposes. Did they bomb the wrong airfield? The bombing mission was reportedly flown by 136 P-38 "droop snoots". 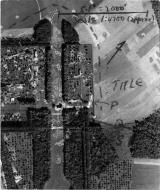 Laupheim Airfield Germany August 11, 1944: Luftwaffe airfield August 11, 1944. Bomb damage assessment. Sortie 2833 of the 7th Photo Group. My father Lt John S Blyth was the pilot. He was flying Spitfire MK XI PL866 and the altitude was approximately 30,000ft. 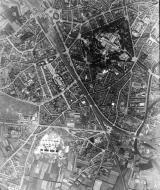 Angers France June 12, 1944: Angers France June 12, 1944. Mission that day was high altitude coverage of the Loire bridges from Nantes to Tours. Photo by Lt John S Blyth flying a Spitfire MK XI. Best viewed in original size. The Chateau was occupied by the Germans at the time hence the military buildings visible within the walls of the Chateau. 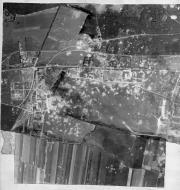 Oschersleben Airfield Germany May 30, 1944: Luftwaffe airfield Germany May 30, 1944 bomb damage assessment. 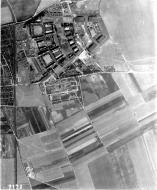 This was a Focke Wulf factory airfield producing primarily FW 190s after 1941. Many aircraft are visible on ground a number of which are destroyed. There seem to be a number of flak batteries as well and some mysterious poofy things casting shadows just above the upper half of the leftmost runway. Whatever they are they are in the air and not on the ground. Mission by Lt. John S Blyth 14th Squadron 7th PRG, Mount Farm, Oxfordshire, UK flying Spitfire MK XI PA841. Best viewed in original size. 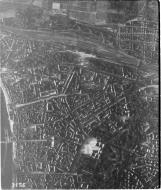 Reims France May 1, 1944: Glad to report that most of the buildings are still there including the Surrender Room, Porte Roma, Reims Cathedral, etc. Photo by Lt John S Blyth flying a Spitfire MK XI. Best viewed in original size. Altitude 6 miles or 9 kilometers. Best viewed in original size. Stendal Airfield Germany: Stendal Airfield near Berlin August 6, 1944. 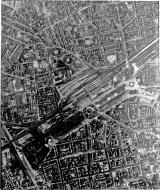 The mission over Berlin lasted approximately 30 minutes which was a long time during that period. Hope you don't mind me taking a few pictures of your airfield from my Spitfire MK XI PA944. 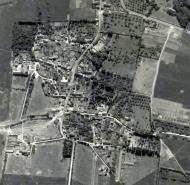 V-2 Site Wizernes France 1: This was a bomb damage assessment mission on August 4, 1944. The targets were Watten, Marquise/Mimoyecques and Wizernes. Pilot was Lt. John S Blyth of the 14th Squadron 7th Photo Group Mount Farm, Oxfordshire, UK flying Spitfire MK XI PA 842. Altitude approximately 15,000 feet. Sortie 2669. 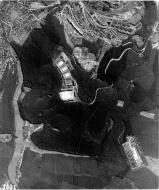 D-Day Beach Mulberry Harbor: Photo of a portion of one of the Mulberry Harbors on June 12, 1944. This was a souvenir photo as my father's primary mission that day was the Loire bridges from Nantes to Tours plus the Nantes airfied. He was flying Spitfire MK XI PA 841 of the 14th Squadron of the 7th Photo Group based at Mount Farm, Oxfordshire, UK. D-Day Beach Mulberry Harbor 3: June 12, 1944. 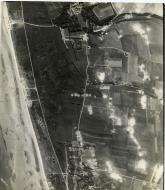 Juno Beach June 12, 1944 View 1: June 12, 1944. Souvenir photo. My father was sent on a mission to photograph the Loire bridges from Nantes to Tours. He was flying Spitifire MK XI PA841 of the 14th Squadron of the 7th Photo Group based at Mount Farm, Oxfordshire, UK. Click on all sizes above and original size to view the high res version. A number of barrage balloons are visible. 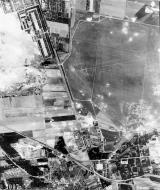 Montdidier Airfield France Montdidier Airfield on July 17, 1944. 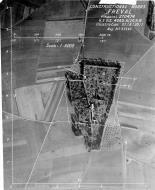 Brandenburg Airfield Germany August 6, 1944: Portion of a Luftwaffe airfield in a photo taken on August 6, 1944 from Spitfire MK XI PA944 flown by Lt. John S Blyth of the 14th Squadron of the 7th Photo Group, Mount Farm, Oxfordshire, UK. 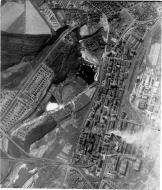 Luxembourg, Luxembourg: Luxembourg City in a photo taken from a Spitfire MK XI of the 7th PRG on May 12, 1944. 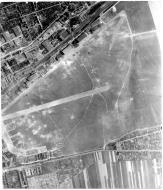 Nantes Airfield France: Luftwaffe airfield at Nantes on June 12, 1944. 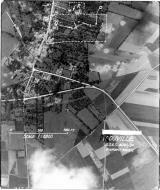 This was a bomb damage assesment mission conducted by a Spitfire MK XI of the 7th PRG. Kassel Germany: Henschel Factory Kassel Germany. 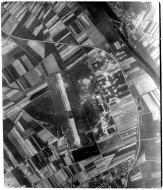 Photo was taken from a Spitfire MK XI of the 7th PRG. 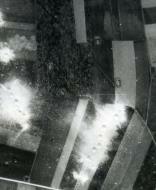 A number of flak batteries are visible. Henschel Flugmotorenbau G.m.b.H Werk Kassel-Altenbauna. 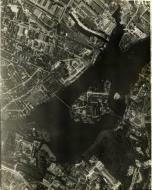 Spandau Berlin: Photo taken August 6, 1944 from a Spitfire MK XI of the 7th PRG. 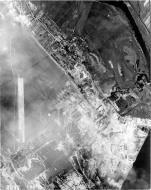 Kassel-Waldau Airfield Germany 1944: Bomb damage assesment photo taken from a Spitfire MK XI of the 7th PRG. 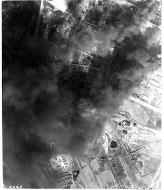 Angers France: Photo taken from a Spitfire MK XI of the 7th PRG on July 24, 1944. 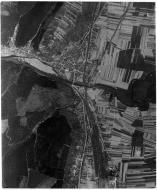 Wurzburg Germany September 10, 1944: Photo taken September 10, 1944 by Lt. John S. Blyth from Spitfire MK XI PA944 of the 14th Squadron, 7th PRG, Mt Farm UK. Targets were Mannheim-Wurzburg-Schweinfurt. 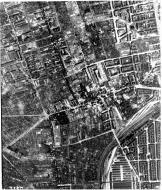 Most of the visible buildings were destroyed in an RAF bomber attack in March, 1945. 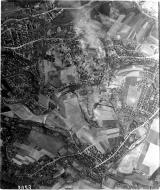 Zwickau Germany August 24, 1944: Sortie 3065 of the 14th Squadron, 7th Photo Group, Mount Farm, UK. The pilot was Lt John S Blyth flying Spitfire PA944 at an altitude of approximately 30,000'. Mission that day was Freital, Ruhland, Brux, Plauen, Kothen A/Fs: Lonnewitz, Preytzch. Thanks to Christian for the ID. 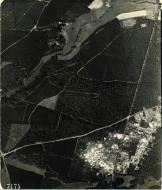 Oil Shale Field Near Bitterfeld, Germany: Photo taken May 30, 1944. Photo By Lt. John S Blyth, 14th Squadron, 7th PRG from Spitfire MK XI PA 841. Altitude was approximately 30,000sf. 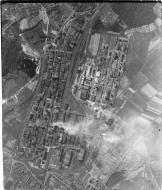 BMW Aero Engine Plant in Allach: August 11, 1944. Per JV this is the BMW AeroEngine Plant in Allach which is a suburb of NW Munich. The factory is still in use and is owned by the Man Company. Two of the buildings have unique camouflage. I am not an expert in such matters but would suspect that the sub camp or out camp Allach must be in this photo. It was part of Dachau. Be sure to view in original high resolution size. 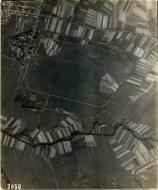 Photo taken by Lt. John S Blyth pilot from 14th Squadron of the 7th Photo Group USAAF based at Mount Farm, UK. He was flying Spitfire Mk XI PL866 and altitude was approximately 5 miles. Freital Germany August 24, 1944: August 24, 1944. 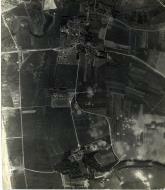 Lt John S Blyth of the 14th Squadron of the 7th Photo Group took this photo. He was flying Spitfire MK XI PA 944. Altitude was approximately 30,000ft. 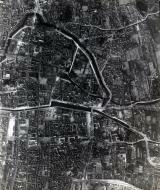 Halberstadt May 30, 1944: May 30, 1944. According to Chiquitaman this is not Bitterfeld although the photo has Bitterfeld written on the back. 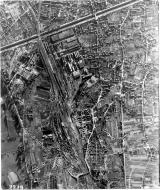 Lille France June 22, 1944: Photo taken on June 22, 1944 from a Spitfire MK XI of the 7th PRG. Bridges France: Sortie 2336 of the 7th PRG flown in Spitfire MK XI MB 948 July 17, 1944. Triere Germany: Sortie 1453 of the 7th PRG flown in a Spitfire MK XI May 12, 1944. 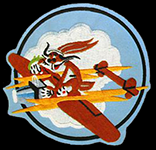 Saarbrucken Germany: Sortie 2833 of the 7th PRG flown in Spitfire MK XI PL 866 on August 11, 1944. Bruges Belgium: Sortie 2422 of the 7th PRG flown July 21, 1944 in Spitfire MK XI MB 948. Bruges Belgium 2: Sortie 2422 of the 7th PRG flown in Spitfire MK XI MB 948 on July 17, 1944. Laon Athies Airfield France: Sortie BB157 of the 7th PRG flown on April 23, 1944 in a Spitfire MK XI. Siegen Germany: September 13, 1944 Siegen Germany. Apparently the railroad yard was the most important target. D-Day+6: June 12, 1944. Souvenir photos of activity off the D-Day beachhead. Sortie 1841 of the 7th PRG flown in Spitfire MK XI PA 841. Pilot was Lt John S Blyth who served with the 22nd and then the 14th Squadron. He was returning from a mission to the Loire bridges. 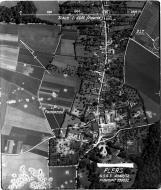 Angers France June 12, 1944: This is Sortie 1841 of the 7th PRG. Targets were the Loire bridges from Nantes to Tours. 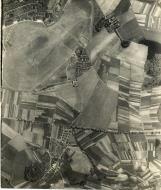 Photos taken from Spitfire MK XI 841 piloted by Lt John S Blyth (USAAF). Angers France June 12, 1944: Sortie 1841 flown in Spitfire MK XI PA 841. Targets were the Loire bridges from Nantes to Tours. 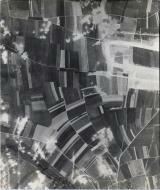 Pilot was Lt. John S Blyth of the 14th Squadron, 7th Photo Group based at Mount Farm, Oxfordshire, UK. 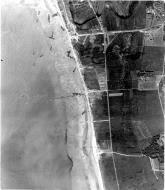 Juno Beach June 12, 1944 View 2 Crop: June 12, 1944. Souvenir photo. Lt John S Blyth was sent on a mission to photograph the Loire bridges from Nantes to Tours. He was flying Spitifire MK XI PA841 of the 14th Squadron of the 7th Photo Group based at Mount Farm, Oxfordshire, UK. 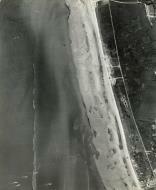 Juno Beach June 12, 1944 View 2: June 12, 1944. Souvenir photo. Lt John S Blyth was sent on a mission to photograph the Loire bridges from Nantes to Tours. He was flying Spitifire MK XI PA841 of the 14th Squadron of the 7th Photo Group based at Mount Farm, Oxfordshire, UK. 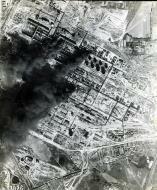 Luftwaffe Airfield Reims Champagne May 1, 1944: Photo taken May 1, 1944. Several damaged aircraft are visible on the ground. 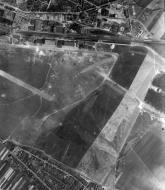 Per JV this airfield is still in use and is called Reims-Champagne. 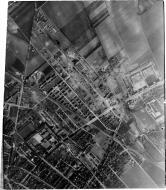 Sortie 1303 flown by Lt John S Blyth, 14th Squadron, 7th Photo Group, Mount Farm, UK. Altitude was approximately 30,000ft and he was flying a Spitfire MK XI. This was a damage assessment mission and several aircraft are visible on the airfield. 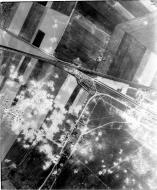 Stendal Airfield Germany August 6, 1944: Photo taken August 6, 1944 by Lt John S Blyth 14th Squadron 7th Photo Group USAAF based at Mount Farm, Oxfordshire, UK. He was flying Spitfire MK XI PA944 and photo was taken from about 30,000'. Best viewed in original size. 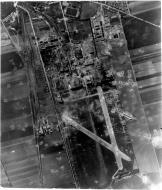 Composite Augsburg Airfield Haunstetten August 11, 1944: Photo taken August 11, 1944 from a Spitfire MK XI of the 14th Squadron of the 7th PRG. 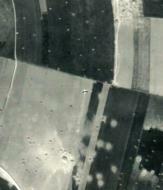 Sortie 2833 of the 14th Squadron, 7th Photo Group, Mount Farm, UK. The pilot was Lt John S Blyth flying Spitfire MK XI PL866. Altitude was approximately 30,000ft. Oschersleben Airfield 2: Scan of a scan so the resolution is not so good. Still it shows more of the runway and additional aircraft. Basdorf Germany: Sortie 2732 of the 7th PRG flown on August 6, 1944 in Spitfire MK XI PA 944. This supposedly shows extensive bomb damage to the Basdorf BMW engine plant. 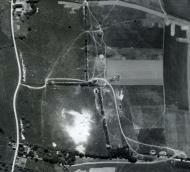 These photos show various V-weapons sites in France taken in 1944 by pilots from the 7th PRG USAAF based at Mt Farm, UK. 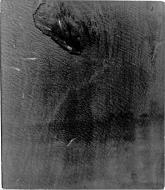 The cutouts visible in some of the photos were required by military censors. These cutouts originally read Noball which was the codename used by the 7th PRG as well as the various 8th and 9th AF bomb groups for V-Weapons sites. These photos were taken as part of Operation Dilly. Some of the higher altitude photos were taken by my father John S. Blyth flying a Spitfire MK XI. 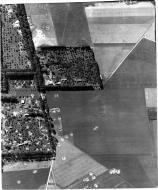 The oblique photos were I believe taken by other pilots of the 7th PRG flying F-5s which was a P-38 variant. 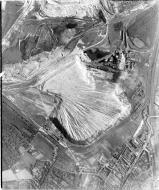 Flers V Weapons Site: V weapons site France July 6, 1944. Pilot was from 7th PRG, Mt Farm, UK. 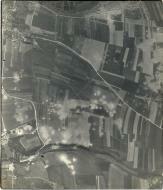 Blangermont V Weapons Site: V weapons site France July 7, 1944. Pilot was from 7th PRG, Mt Farm, UK flying a Spit MK XI. 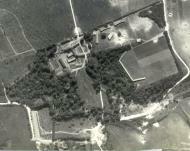 Chateau De Bosmelet V-1 Site: V Weapons site France with great old chateau. Chateau De Bosmelet DA: Sorry to say someone came in and blew some things up. The chateau was repaired however and is as good as new. 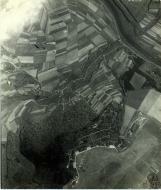 Prouville V-1 Weapons Site: Mission flown by a pilot of the 7th PRG Mt Farm, UK. P=launch ramp. Q=nonmagnetic building. R=assembly building. 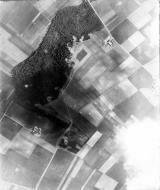 Bois De Harel V Weapons Site: Mission flown July 7, 1944 by a pilot of the 7th PRG, Mt Farm, UK. 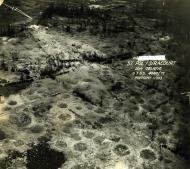 This was an active V-1 site as evidenced by the skid spray pattern in the field in line with the launch pad (P) to the Northwest. Q is the non magnetic building where they would 'swing the compass' which aligned the V-1 to the target. They performed this job by hammering the bomb with wooden mallets. 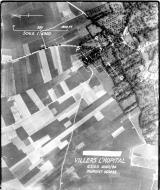 Villers L'Hopital: V Weapons site France July 4, 1944. This was the first successful day for Operation 'Dilly' which targeted the Noball sites. 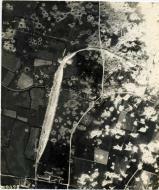 Beauvoir: Per JV photo shows portion of the Beauvoir Airfield and a portion of the nearby V-1 site both heavily damaged. According to Laurent this is German site No. 654 with 3 V-1 rocket sites. 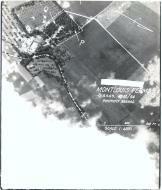 V-3 Site Mimoyecques France: Photo taken August 4, 1944 by a Spitfire MK XI of the 7th PRG, Mt Farm, UK. V-1 Site Bois de Radinghem France: Not Bois de Coupelle per JV. 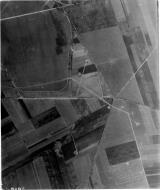 V-2 Site Wizernes France 2: Photo taken August 4, 1944 from a Spitfire MK XI of the 7th PRG, Mt Farm, UK. Altitude was approximately 15,000sf. 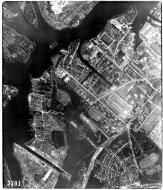 V Weapons Site Flottemanville Hague II: V-1 site after bombing (strafing?). 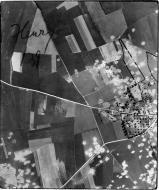 This oblique photo was taken on August 1, 1944 at 14:30 hours by a pilot of the 7th PRG flying an F-5 which was a P-38 variant. 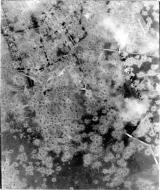 V-1 Weapons Site Fleury:Photo taken July 6, 1944 by Spitfire MK XI PA944 of the 7th PRG. Altitude was approximately 15,000 feet. This appears to be an active V-1 site as there are skid marks in line with the launch ramp to NW. 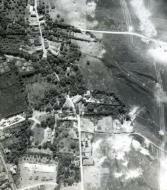 V-Weapons Site France August 4, 1944: Sortie 2669 of the 14th Squadron, 7th Photo Group, Mount Farm, UK. 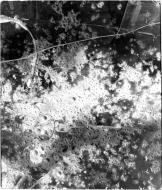 Targets were V-Weapons sites at Watten, Marquise/Mimoyecques, Wizernes (Aphrodite Targets). Pilot was Lt John S Blyth flying Spitfire MK XI PA842. Altitude was approximately 15,000ft. 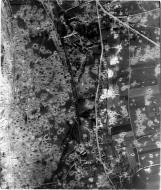 V-1 Site St Pol/Siracourt France July 7, 1944: Low oblique photo by Lt Col Norris E Hartwell of the 7th Photo Group based at Mount Farm, UK. He was flying an F-5 (P-38 variant). 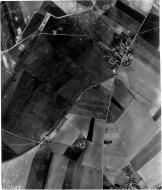 Mont Louis Ferme V-1 Site July 4 1944: Sortie 2180 of the 7th Photo Group flown on July 4, 1944 by Lt John S Blyth of the 14th Squadron flying Spitfire MK XI MB948 'Oh Johnnie.' Altitude was about 15,000ft. The pointer in the upper right is pointing north. The launch ramp 'P' is oriented in a northwesterly direction probably towards London. Take a look at the ramp in original size. Targets that day were Gorensfield ? area, woods south of Domleger and Domvast. 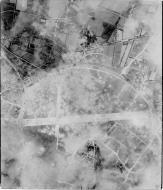 Active V-1 Site Fleury Pas de Calais July 6, 1944: Photo by Lt John S Blyth of the 14th Squadron, 7th Photo Group, Mount Farm, UK. He was flying Spitfire MK XI PA944 at about 15,000ft. Top of photo is roughly North. Sortie 1841 of the 14th Squadron of the 7th Photo Group, Mount Farm, UK. Mission was flown by Lt John S Blyth flying Spitfire MK XI PA841. These were souvenir photos as the primary targets were the Loire bridges between Nantes and Tours. Somewhere South of Juno Beach 1 June 12 1944: Photo by Lt John S Blyth of the 14th Squadron, 7th Photo Group, Mount Farm, Oxfordshire, UK. He was flying Spitfire MK XI PA 841 and altitude was about 30,000'. 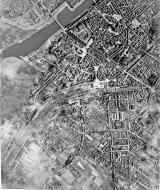 The actual targets that day were Loire bridges from Nantes to Tours, La Huichetiere, Nantes Airfield, Le Port Boulet Bridge DA. He returned via Juno Beach and took some souvenir photos along the way. He had no idea what was on the ground in this photo. Somewhere South of Juno Beach 3 June 12 1944: Photo by Lt John S Blyth of the 14th Squadron, 7th Photo Group, Mount Farm, Oxfordshire, UK. He was flying Spitfire MK XI PA 841 and altitude was about 30,000'. The actual targets that day were Loire bridges from Nantes to Tours, La Huichetiere, Nantes Airfield, Le Port Boulet Bridge DA. He returned via Juno Beach and took some souvenir photos along the way. He had no idea what was on the ground in this photo. 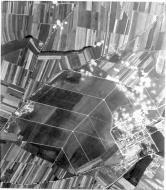 Somewhere Southwest of Juno Beach June 12 1944: Check out the barrage balloons. I count at least 12. June 12, 1944. Photo by Lt John S Blyth of the 14th Squadron, 7th Photo Group, Mount Farm, Oxfordshire, UK. He was flying Spitfire MK XI PA 841 and altitude was about 30,000'. 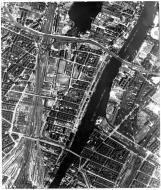 The actual targets that day were Loire bridges from Nantes to Tours, La Huichetiere, Nantes Airfield, Le Port Boulet Bridge DA. He returned via Juno Beach and took some souvenir photos along the way. He had no idea what was on the ground in this photo. ALG B3 (Advanced Landing Ground) Sainte Croix sur Mer June 12, 1944: According to JV this is ALG B3 at Sainte Croix sur Mer. The aircraft visible on the ground are therefore from the RCAF. The aircraft at this field may have included Spitfire MK IXs, Photo recce Mustangs and Typhoons. The A/C on the ground appear to have invasion stripes. The celebrated British ace 'Johnnie' Johnson served with the RCAF 144th Wing here. 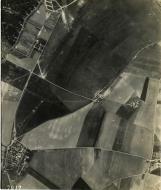 Photo by Lt John S Blyth of the 14th Squadron, 7th Photo Group, Mount Farm, Oxfordshire, UK. He was flying Spitfire MK XI PA 841 and altitude was about 30,000'. The actual targets that day were Loire bridges from Nantes to Tours, La Huichetiere, Nantes Airfield, Le Port Boulet Bridge DA. He returned via Juno Beach and took some souvenir photos along the way. He had no idea what was on the ground in this photo. ALG B3 (Advanced Landing Ground) Sainte Croix sur Mer June 12, 1944 crop 1: According to JV this is ALG B3 at Sainte Croix sur Mer. The aircraft visible on the ground are therefore from the RAF or RCAF since the B designation referrred to RAF advanced landing grounds. The aircraft at this field may have included Spitfire MK IXs, Photo recce Mustangs and Typhoons. The A/C on the ground appear to have invasion stripes. 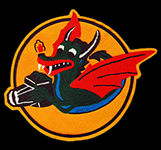 The celebrated British ace 'Johnnie' Johnson served with the 144th Wing here. Photo by Lt John S Blyth of the 14th Squadron, 7th Photo Group, Mount Farm, Oxfordshire, UK. He was flying Spitfire MK XI PA 841 and altitude was about 30,000'. The actual targets that day were Loire bridges from Nantes to Tours, La Huichetiere, Nantes Airfield, Le Port Boulet Bridge DA. He returned via Juno Beach and took some souvenir photos along the way. He had no idea what was on the ground in this photo. ALG B3 (Advanced Landing Ground) Sainte Croix sur Mer June 12, 1944 crop 2: According to JV this is ALG B3 at Sainte Croix sur Mer. The aircraft visible on the ground are therefore from the RCAF. The aircraft at this field may have included Spitfire MK IXs, Photo recce Mustangs and Typhoons. The A/C on the ground appear to have invasion stripes. The celebrated British ace 'Johnnie' Johnson served with the RCAF 144th Wing here. Photo by Lt John S Blyth of the 14th Squadron, 7th Photo Group, Mount Farm, Oxfordshire, UK. He was flying Spitfire MK XI PA 841 and altitude was about 30,000'. The actual targets that day were Loire bridges from Nantes to Tours, La Huichetiere, Nantes Airfield, Le Port Boulet Bridge DA. He returned via Juno Beach and took some souvenir photos along the way. He had no idea what was on the ground in this photo. 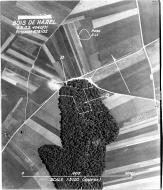 Juno Beach Barrage Balloon Crop June 12 1944: At least 8 barrage balloons and their shadows. 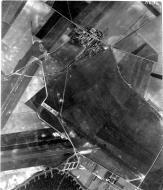 Photo by Lt John S Blyth of the 14th Squadron, 7th Photo Group, Mount Farm, Oxfordshire, UK. He was flying Spitfire MK XI PA 841 and altitude was about 30,000'. The actual targets that day were Loire bridges from Nantes to Tours, La Huichetiere, Nantes Airfield, Le Port Boulet Bridge DA. He returned via Juno Beach and took some souvenir photos along the way. He had no idea what was on the ground in this photo. 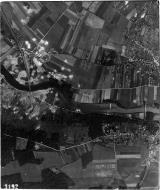 Near Juno Beach/Village With Balloon Crop June 12 1944: Photo by Lt John S Blyth of the 14th Squadron, 7th Photo Group, Mount Farm, Oxfordshire, UK. He was flying Spitfire MK XI PA 841 and altitude was about 30,000'. The actual targets that day were Loire bridges from Nantes to Tours, La Huichetiere, Nantes Airfield, Le Port Boulet Bridge DA. He returned via Juno Beach and took some souvenir photos along the way. He had no idea what was on the ground in this photo. Near Juno Beach Vehicles on Ground June 12 1944: Photo by Lt John S Blyth of the 14th Squadron, 7th Photo Group, Mount Farm, Oxfordshire, UK. He was flying Spitfire MK XI PA 841 and altitude was about 30,000'. The actual targets that day were Loire bridges from Nantes to Tours, La Huichetiere, Nantes Airfield, Le Port Boulet Bridge DA. He returned via Juno Beach and took some souvenir photos along the way. He had no idea what was on the ground in this photo. Near Juno Beach June 12 1944: Photo by Lt John S Blyth of the 14th Squadron, 7th Photo Group, Mount Farm, Oxfordshire, UK. He was flying Spitfire MK XI PA 841 and altitude was about 30,000'. The actual targets that day were Loire bridges from Nantes to Tours, La Huichetiere, Nantes Airfield, Le Port Boulet Bridge DA. He returned via Juno Beach and took some souvenir photos along the way. He had no idea what was on the ground in this photo. 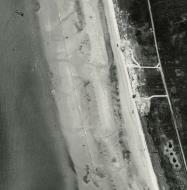 Juno Beach June 12 1944 Hello Down There Crop: Photo by Lt John S Blyth of the 14th Squadron, 7th Photo Group, Mount Farm, Oxfordshire, UK. He was flying Spitfire MK XI PA 841 and altitude was about 30,000'. 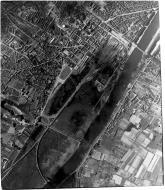 The actual targets that day were Loire bridges from Nantes to Tours, La Huichetiere, Nantes Airfield, Le Port Boulet Bridge DA. He returned via Juno Beach and took some souvenir photos along the way. He had no idea what was on the ground in this photo. Juno Beach 4 Strange Objects June 12 1944:Photo by Lt John S Blyth of the 14th Squadron, 7th Photo Group, Mount Farm, Oxfordshire, UK. He was flying Spitfire MK XI PA 841 and altitude was about 30,000'. The actual targets that day were Loire bridges from Nantes to Tours, La Huichetiere, Nantes Airfield, Le Port Boulet Bridge DA. He returned via Juno Beach and took some souvenir photos along the way. He had no idea what was on the ground in this photo. 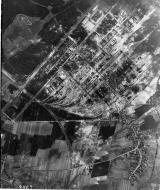 Luftwaffe Airfield Reims Champagne May 1, 1944 View 2: Sortie 1303 flown by Lt John S Blyth, 14th Squadron, 7th Photo Group, Mount Farm, UK. Altitude was approximately 30,000ft and he was flying a Spitfire MK XI. This was a damage assessment mission and several aircraft are visible on the airfield. 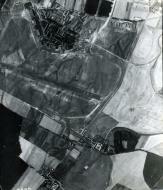 Thanks JV for IDing View 1 of this airfield as seen below. 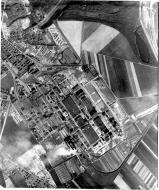 Ypres/Vlamertinge Airfield Belgium 1943 or 1944: Photo by pilot of the 7th Photo Group, Mount Farm, UK flying an F-5 (P-38). Thanks to JV for IDing the airfield. Spandau Citadel Germany August 6, 1944: Sortie 2732 of the 7th Photo Group. The pilot was Lt John S Blyth of the 14th Squadron flying Spitfire MK XI PA944. 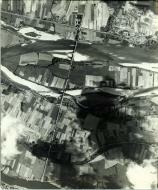 Gent July 19, 1944: Photo by Lt John S Blyth, 14th Squadron, 7th Photo Group, Mount Farm, UK flying a Spitfire MK XI. 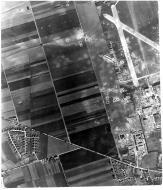 Sankt Niklaas Airfield Near Gent (Ghent) July 18, 1944: Sortie 2374 of the 14th Squadron, 7th Photo Group, Mount Farm, UK. Targets that day were Ghent to Antwerp, RR Ghent to Terneuzen. Pilot was Lt John S Blyth flying Spitfire MK XI MB948 at altitude of approximately 30,000ft. 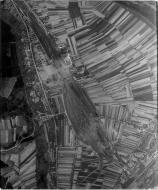 Luftwaffe Airfield Laon Athies April 23, 1944: Sortie BB157 of the 14th Squadron, 7th Photo Group, Mount Farm, UK. This was a DA mission flown in a Spitfire MK XI at about 30,000'. The pilot was Lt. John S Blyth and this was his first mission in a Spitfire. I previously posted another view from this same run. Best viewed in original size. Zwickau Luftwaffe Airfield, Factory and Marshaling Yard Germany August 24, 1944: Sortie 3065 of the 14th Squadron, 7th Photo Group, Mount Farm, UK. The pilot was Lt John S Blyth flying Spitfire PA944 at an altitude of approximately 30,000'. 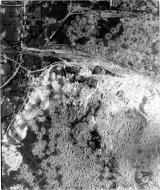 Numerous destroyed aircraft are visible in the photo. There may also be a camo tent over 3 splitter pens. Mission that day was Freital, Ruhland, Brux, Plauen, Kothen A/Fs: Lonnewitz, Preytzch. Thanks to Christian for the ID. 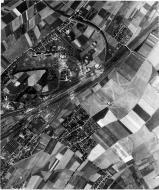 Kassel Rothwesten Airfield May 9, 1944 View 2: Sortie 1365 of the 14th Squadron, 7th Photo Group, Mount Farm, Oxfordshire, UK. Pilot was Lt John S Blyth flying a Spitfire MK XI at about 30,000'. 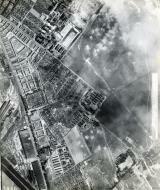 Factory Berlin Basdorf August 6, 1944: Sortie 2732 of the 14th Squadron, 7th Photo Group, Mount Farm, UK. Pilot was Lt John S Blyth flying Spitfire MK XI PA944. This looks like a nice cheery place. 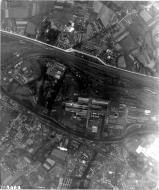 Halberstadt Luftwaffe Airfield May 30, 1944: Sortie 1670 of the 14th Squadron, 7th Photo Group, Mount Farm, UK. Pilot was Lt John S Blyth flying Spitfire MK XI PA841 at an altitude of approximately 30,000ft. 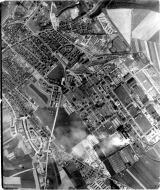 Dunkerque (Dunkirk) 1943 or 1944: Photo taken by Lt John S Blyth, 22nd Squadron, 7th Photo Group, Mount Farm, UK probably in 1943. He was flying an F-5 (P-38). This was probably a practice mission. 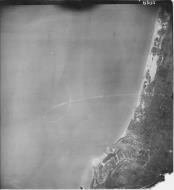 ALG B3 Saint Croix sur Mer June 12, 1944: According to JV this is ALG B3 at Sainte Croix sur Mer. The aircraft visible on the ground are therefore from the RCAF. The aircraft at this field may have included Spitfire MK IXs, Photo recce Mustangs and Typhoons. The A/C on the ground appear to have invasion stripes. The celebrated British ace 'Johnnie' Johnson served with the RCAF 144th Wing here. Photo by Lt John S Blyth of the 14th Squadron, 7th Photo Group, Mount Farm, Oxfordshire, UK. He was flying Spitfire MK XI PA 841 and altitude was about 30,000'. 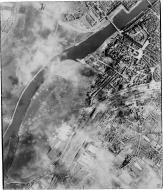 The actual targets that day were Loire bridges from Nantes to Tours, La Huichetiere, Nantes Airfield, Le Port Boulet Bridge DA. He returned via Juno Beach and took some souvenir photos along the way. He had no idea what was on the ground in this photo. 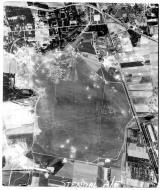 Dessau Junkers Factory Airfield May 30, 1944 2: Luftwaffe factory airfield May 30, 1944. This was a Junkers factory airfield. Numerous aircraft are visible including possible JU-290s and a 390. Photo by Lt John S Blyth flying Spitfire Mark XI PA841. Best viewed in original size. Photo taken from about 30,000ft. Here is the original photo from this run. One aircraft is in motion and another one appears out of nowhere in this 2nd photo above. Junkers Flugzeugwerke Dessau. Loire Bridge June 12, 1944: Bridge at Chalonnes sur Loire. Mission that day was high altitude coverage of the Loire bridges from Nantes to Tours. Photo by Lt John S Blyth of the 14th Squadron, 7th Photo Group flying Spitfire MK XI PA 841. Best viewed in original size. 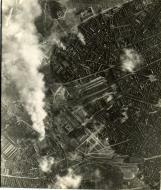 Lille France June 22, 1944 #2: Lille wa apparently bombed that day and the smoke plume is possibly a target marker dropped by a B-17 or Pathfinder. 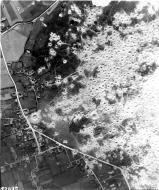 Photo was taken at about 30,000ft by Lt John S Blyth, 14th Squadron, 7th Photo Group, Mount Farm, UK. He was flying Spitfire MK XI MB948. 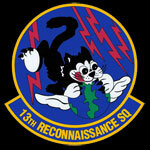 In addition to Lille his targets that day included V-weapons sites. Kassel-Rothwesten Luftwaffe Airfield Germany May 9, 1944: Sortie 1365 of the 14th Squadron, 7th Photo Group, Mount Farm, UK. Pilot was Lt John S Blyth. He was flying a Spitfire MK XI at about 30,000ft. 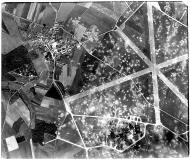 Targets that day were airfields at Fulda and Kassel Rothwesten. Some of the aircraft on the field appear to be quite tiny. Luftwaffe Airfield Germany August 12, 1944: Sortie 3272 of the 14th Squadron, 7th Photo Group, Mount Farm, UK. Targets were reportedly Hanau-Eisenach? Pilot was Lt John S Blyth flying a Spitfire MK XI at about 30,000ft. There do not seem to be many aircraft on the field. 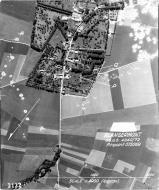 Alt Lonnewitz Luftwaffe Factory Airfield August 24, 1944: Sortie 3065 of the 14th Squadron, 7th Photo Group, Mount Farm, UK. Targets were Freital, Ruhland, Brux, Plauen, Kothen A/Fs; Lonnewitz, Preytzch. Photo by Lt John S Blyth flying Spitfire MK XI PA944. Seems to be pretty heavily defended. The Arado 234 jet was manufactured here. 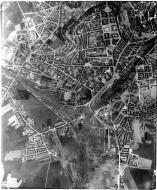 Luftwaffe Airfield Laon Athies France April 23, 1944: Bomb damage assessment flown by Lt John Blyth, 14th Squadron, 7th Photo Group, Mount Farm, UK. He was flying a Spitfire MK XI at about 30,000ft. It doesn't seem like there is a lot of DA work to be done. 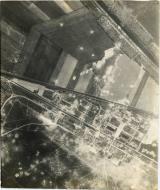 Ruhland Synthetic Oil Refinery August 24, 1944: Bomb damage assessment mission flown by Lt John S. Blyth, 14th Squadron, 7th Photo Group, Mount Farm, UK. This was sortie 3065 and he was flying Spitfire MK XI PA 944. Altitude was approximately 30,000ft. 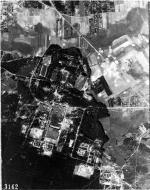 Brux (Most) Oil Refinery August 24, 1944: Bomb damage assessment mission flown by Lt John S. Blyth, 14th Squadron, 7th Photo Group, Mount Farm, UK. This was sortie 3065 and he was flying Spitfire MK XI PA 944. Altitude was approximately 30,000ft. Trier-Pfalzel May 12, 1944: Sortie 1453 flown by Lt John S. Blyth of the 14th Squadron, 7th Photo Group, Mount Farm, UK. Photo was taken from about 30,000' and he was flying an unspecified Spitfire MK XI. The place is well defended with what appear to be some very large flak guns or maybe dummies? 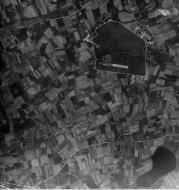 Konz-Karthaus May 12, 1944: Sortie 1453 flown by Lt John S. Blyth of the 14th Squadron, 7th Photo Group, Mount Farm, UK. Photo was taken from about 30,000' and he was flying an unspecified Spitfire MK XI. 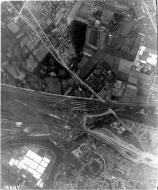 Several important bridges are seen as well as marshaling yard and bombed out factory of some type. 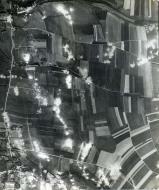 Ehrang May 12, 1944: Sortie 1453 flown by Lt John S. Blyth of the 14th Squadron, 7th Photo Group, Mount Farm, UK. Photo was taken from about 30,000' and he was flying an unspecified Spitfire MK XI. Several important bridges are seen as well as marshaling yard. 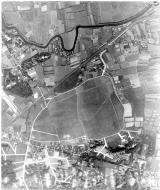 Troyes France May 1, 1944: Sortie 1303 flown by Lt John S Blyth, 14th Squadron, 7th Photo Group, Mount Farm, UK. He was at about 30,000' and was flying a Spitfire MK XI. Arnimswalde: This was one of the missions from the rare dossier. Bremen: Photo taken soon after the war's end. 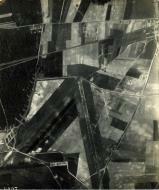 Giebelstadt: Photo taken soon after the war's end. 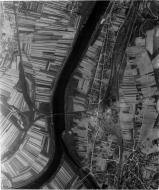 Loire Bridges: Loire Bridge mission flown June 2, 1944 accompanied by 16 P-38 fighters. From the dossier. F-5B serial number 42-67342 named "Double Trouble" from the 27th PRS. Oberpfaffenhofen Do-335s: Dornier 335s after the war ended. These photos were probably from the "trolley" missions. From the 7th Photo Recon Group's book "Now It Can Be Told". As far as I know it is not copyrighted. Some appear to be A-1s and others appear to be A-6s. Schwabisch Hall 2: After the end of the war. Volkswagen Factory Fallersleben: Various targets including the Volkswagenwerke GMBE at Fallersleben. Photos taken from Spitfire MK XI MB 956. 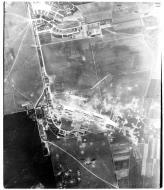 Villacoublay Airfield: Villacoublay Airfield France after the war's end. Sortie 2263 flown by Lt Col Norris E Hartwell Jr of the 7th Photo Group, Mount Farm, UK. Special Military Construction = V-Weapons site. He was flying F-5B 42-68213. 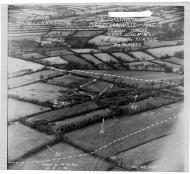 Hartwell was subsequently shot down at low level by flak at the Pas de Calais flying an oblique v-1 weapons mission. This was on August 12, 1944 and he was flying F-5B 42-67319. He survived a harrowing low level bailout and became a POW. This is a page from a secret bulletin which was distributed to the pilots of the group during the war. Schwabisch Hall ME 262: Destroyed ME 262 after the end of the war. 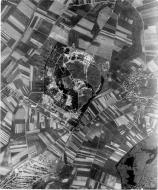 Lt John R Richards Mission August 6, 1944: Sortie 2734 of the 14th Squadron, 7th Photo Group, Mount Farm, UK flown in Sptifire MK XI MB 956. 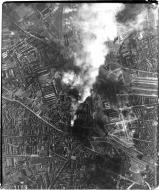 Targets were Halberstadt, Magdeburg, Fallersleben, Brunswick and Dollbergen. Richards was one of only two pilots from the group to receive a DSC. This is a page from a secret bulletin which was distributed to the pilots of the group during the war.